BellCommander works with the Barix BarioNet to remotely control relays for bell systems, sirens, light devices, and more. 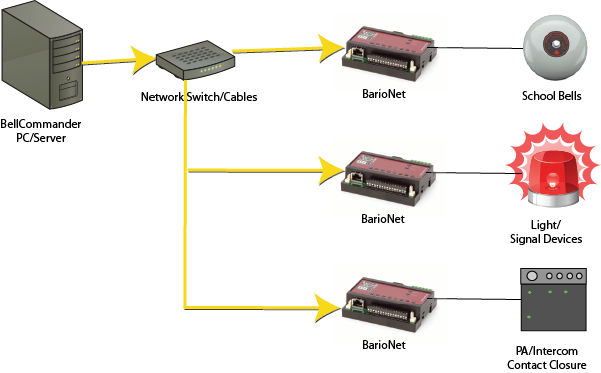 Bell systems that connect to a mechanical or electronic device for scheduling via relays or contact closures can be replaced with the Barix BarioNet relay controller and the BellCommander network software. Each BarioNet device contains two relays that can be activated over a network by BellCommander. BellCommander supports multiple BarioNet devices, so relays can be activated in multiple buildings using a single copy of BellCommander. Barix network audio devices and client PCs can also be added to this configuration. So, audio can be streamed to a Barix Exstreamer and a Barix BarioNet could trigger a relay for a strobe light to provide both audio and visual notifications. The relays are capable of 5.0 Amps at up to 240VAC. Pricing depends on the total number of network devices. A BellCommander network license should be purchased along with the Barix BarioNet devices. For up to 10 Barix devices, the BellCommander Small Network Version license for $299.95 would be used.